Perfect for leftovers, easy to store. Because they fit and arent larger than the dish, there isnt water sitting in the microwave. I use them every day. Very easy to clean. Saves me money since I dont need to use wax paper to cover the food. Bettet for environment-not throwing away wax paper or other disposable coverings. Don't hesitate, just buy a set! Food reheats faster when the steam is retained a bit, I also love that these stop messy splatters in the microwave. What's not to like? I use these for warming soups in bowls that are ready to serve so that the bowl keep soup hot. Find something in the freezer for dinner; use these covers to re-heat. Easy as pie - no mess in your microwave either. Best product for the gal on the go ! Barb, gal on the go! use every time I heat food in the microwave. I just love the Vented Microwave Plate Coves - Set of 5. It's just ideal and it's a complete set of 5 in different sizes, which makes it more convenenent. Worth the Money for it keeps things hot and cooks them as well. Excellent!! This product is well-worth the money! My family uses the microwave a lot to reheat foods and these covers are great for keeping my microwave clean. This set of Microwave covers is wonderful. I've only had it for a little over a week and have already used 3 of the 5 covers. It's terrific and a great way to keep spatters out of your Microwave and to heat food efficiently. I use the plate covers to heat left overs. I was surprised to the quality of the covers, I expected them to be flimsy, but they are not, they are very well made. Glad I purchased them! 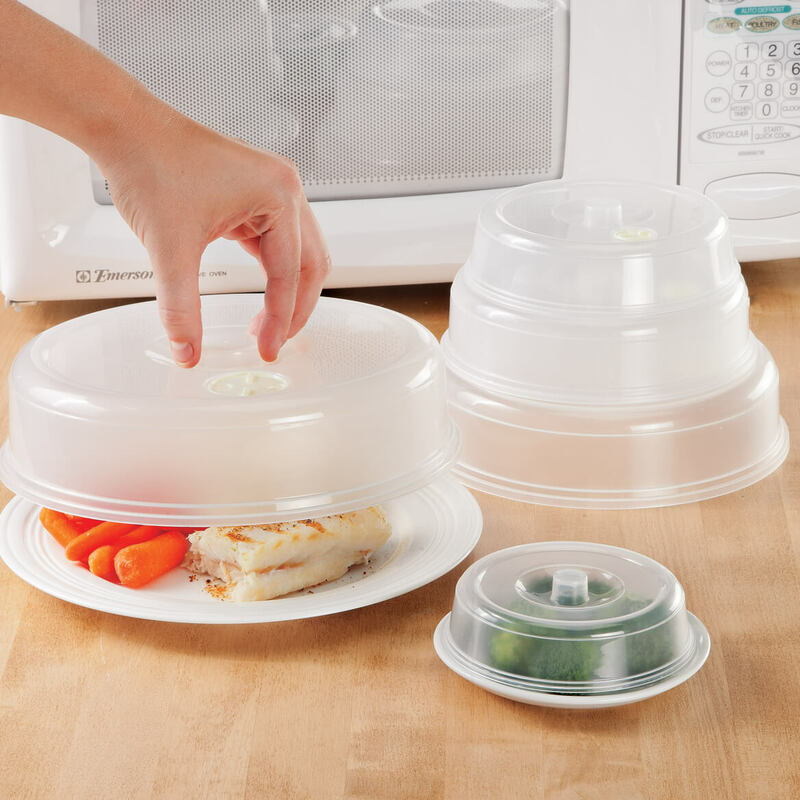 These microwave covers are a great idea because you can use whatever size you need. eg. leftovers, butter, small plates and/or dinner plates. A hard-to-find item. Looked Like it would work....And it Does! I use these almost everyday. Never hace to clean the microwave. Whats better then that? I especially use these to cover food with a tomato base. I use these for warm ups in the micro. I like that they come in different sizes. They are easy to clean. I just wash them by hand in hot soapy water and rinse. That's it. I am very happy with the covers and would recommend them. I use it for re-heating leftovers and they work great. Have recommended them to friends and my daughter. Really like the different sizes. A must have for the microwave! I've used these covers for years and they have held up well. I rinse with water right after using them and let them dry. The microwave stays clean! My friend saw me using them and wanted her own. So this purchase was a gift for her. Easy to use and easily cleaned. I use the covers to reheat food and frozen meals. They keep my microwave clean and clean up is very easy. Would recommend these for anyone using a microwave. I prefer this to using paper towels as covers. I ordered this because my last microwave plate got damaged. I guess I didn't pay attention to the size of the plates they were a bit smaller than I expected. However they fit the purpose. These are great, no more splater in the microwave. 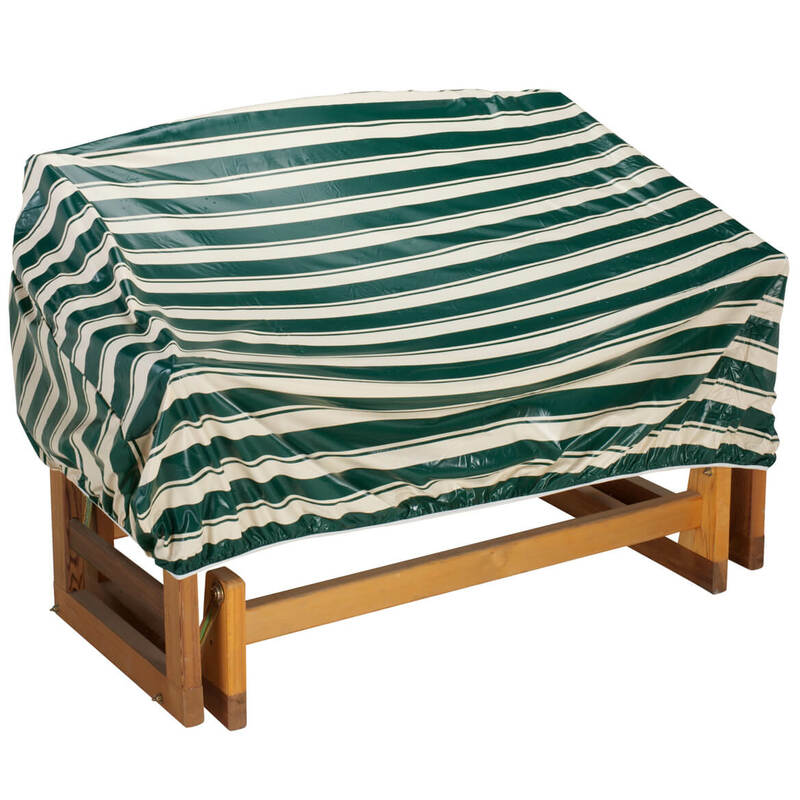 You can also use them to cover your food on the table while you get other things, no worries about anything falling into the food or it getting cold. I was expecting the covers to be just a little bit larger. However, they suit the purpose I needed them for and I use them daily. Handy to prevent microwave splashes. Sized to fit variety of plates/dishes. Close the steam vent and can also be left in place for food storage. Button on top makes it easy to remove. Items are much smaller than I thought. However, they are useful for small reheats, etc. One of the covers opening for steam keeps falling off but the others seem to be okay. Again, these are okay for small reheated dishes. I use it to warm up leftovers in the microwave. I like the various sizes and that they are dishwasher safe. My problem is that the handles are too small to grip. The vent buttons also fell out. I asked if the small one has a vent on it, because you can't tell in their picture. They said it did, but you can't open and close it. It only has a tiny hole in it. The larger ones you can't hold the handles. I have small hands. As it gets smaller, the handle gets bigger to grab. But these came warpped & the food stains inside them. I didn't get all of them that they say you get. Why do I keep getting bend products, especially plastic or tin items? Too small for a regular dinner plate, and the handle in the middle of it - much too small to gab, slips out of your hands. 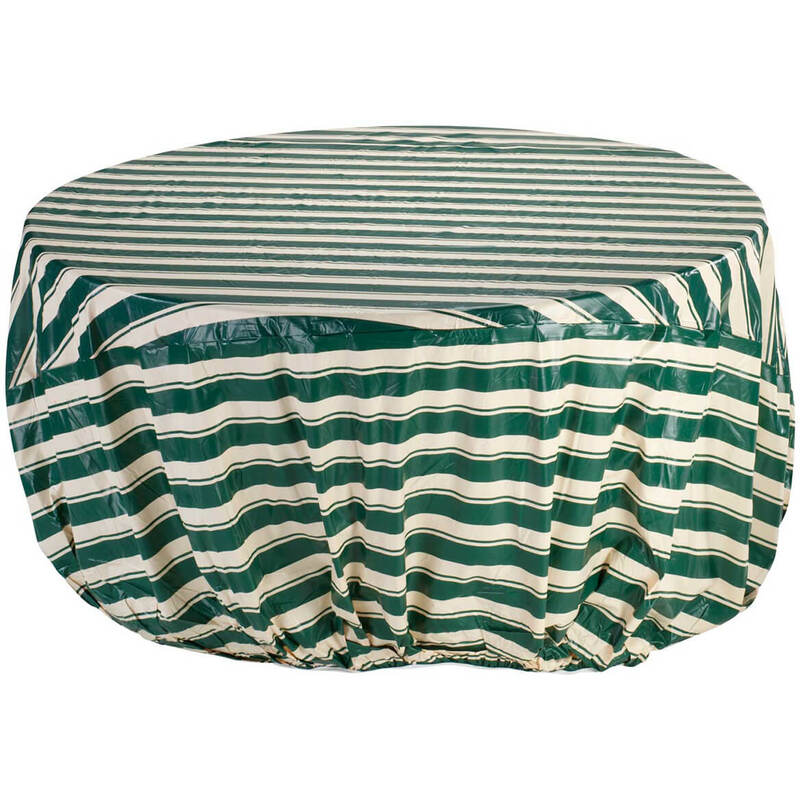 Just wanted a large cover to use over dinner plates. returned not happy the largest one would not even cover my dinner plate. item too small to use. Good idea to try out. To cover different size dishes in microwave. I had seen this item before and didn't order at the time. I have been looking for them ever since then and I finally found them. Thank you! Inexpensive and helps keep the microwave clean! Vented covers work better than paper towels! I like these microwave covers, havn't seen these sizes anywhere else. I needed new ones because I always seem to melt items as they are stored in the oven. My mother has these and likes them. Would come in handy when using the microwave. I have one big one and love it. I use these and they are wonderful. It is great doing business with Walter Drake. Very reliable. Thank you. I this is a great product. I need microwave covers that are different sizes. I always used a paper towel to cover a plate and messy. It is an easy way to keep the microwave clean from splatters when re-heating food. To help save on the mess that is made when reheating food in the microwave. I had a set of these covers for about 10 years and they needed to be replaced. I cook with propane and use the microwave a lot. This will help save cleaning the microwave from splatters. Easy to use; keeps microwave clean. 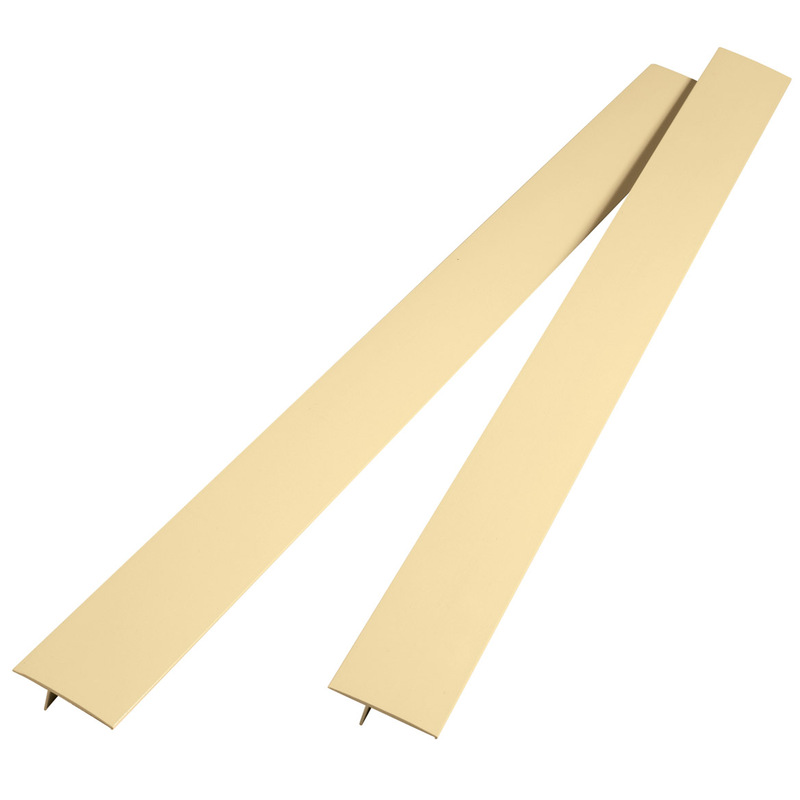 These would not leave wax on the food like wax paper. I have a large one, but i wanted another one and these have different sizes. I really like that it has the different sizes. BEST ANSWER: Thank you for your question. 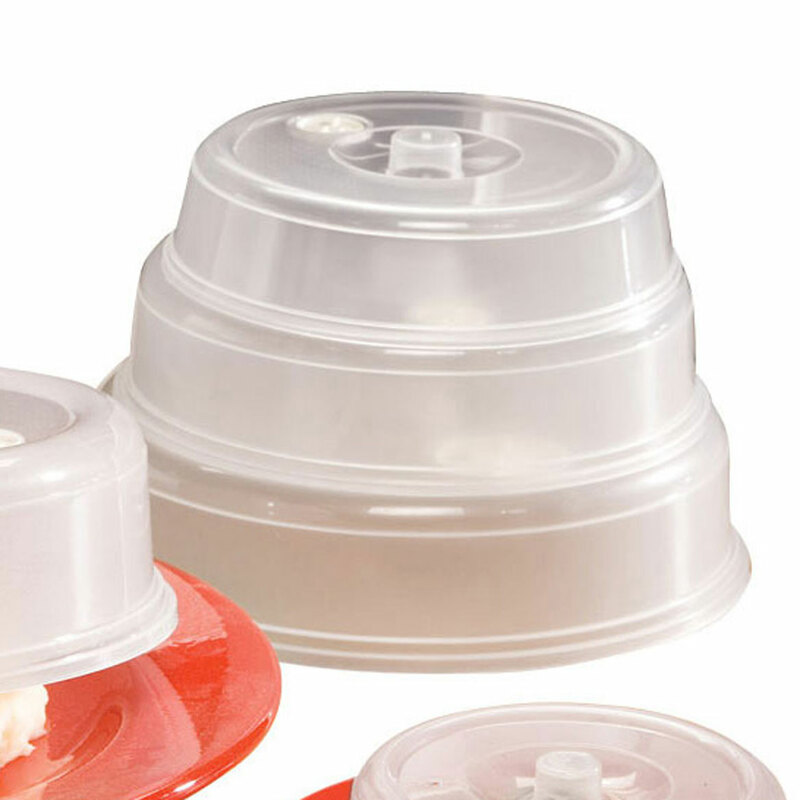 The Vented Microwave Plate covers are BPA free. We hope this information is of help to you. I have NO idea. That is a technical question for the manufacturer. BEST ANSWER: Yes, but I wouldn't recommend them, I had them replaced twice, the air vents keep falling off, if it wasn't because of that, I love them and all the different sizes is awesome. Thank you for your question. This item is BPA free. We hope this information will be of help to you. Are these made in the USA ? BEST ANSWER: Thank you for your question. No, this item is made in China. We hope this information will be of help to you. where is this product made and is it BPA free ? BEST ANSWER: Thank you for your question. Yes, this item is BPA free and is made in China. We hope this information will be of help to you. BEST ANSWER: Thank you for your question. The Vented Microwave Plate covers come in five sizes. They are: 4 ½” diameter x 1 ¼” high, 5 ¾” diameter x 1 ½” high, 6 ½” diameter x 2” high, 7 ¾” diameter x 2 ¼” high, and 8¾” diameter x 2 ½” high. We hope this information will be of help to you. Can these covers be used to cook two plates by stacking them? BEST ANSWER: Thank you for your question. This item is not recommended for stacking. We hope this information will be of help to you. Our decorative toilet lid cover puts a lid on shockingly cold, hard toilets. 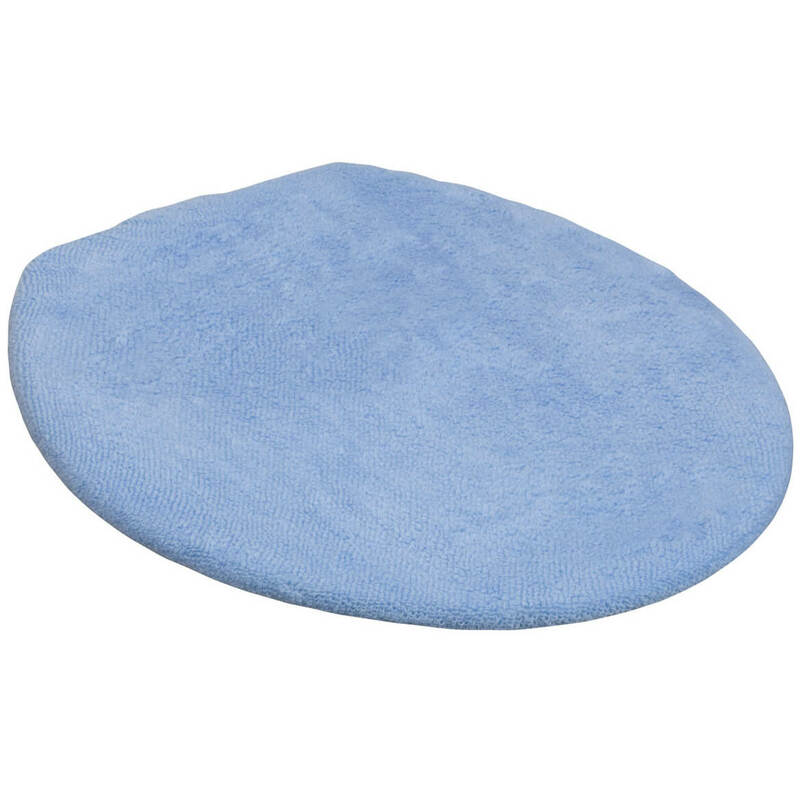 Bathroom toilet lid cover keeps dust at bay and quiets slamming lids. 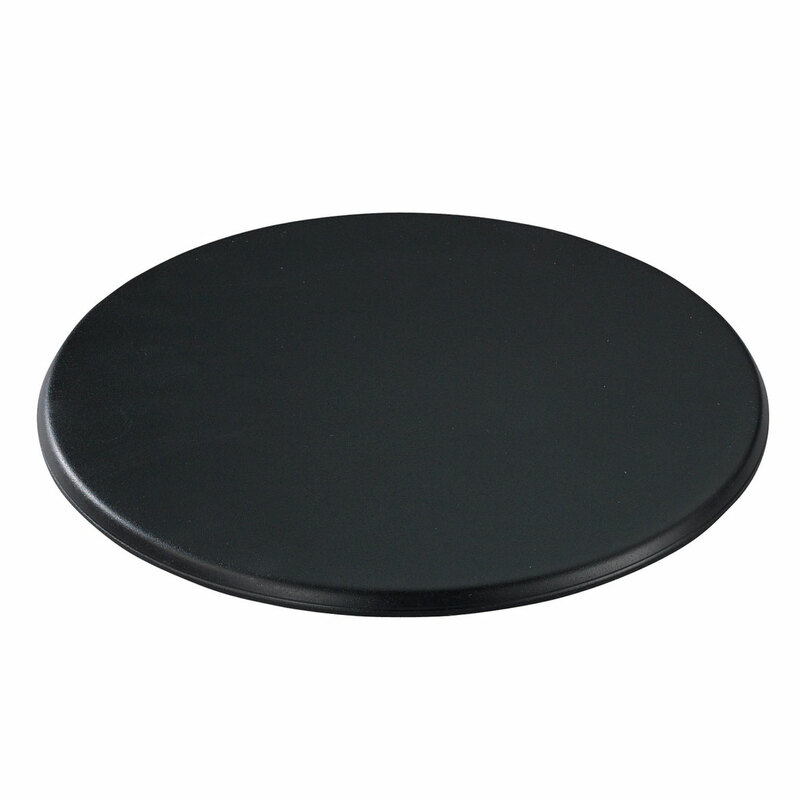 Fits standard round and oval lids. Machine washable, 90% acrylic/10% polyester. Imported.